It was my pleasure to contribute the article on Napoleon Bonaparte to this important encyclopedia. The Encyclopedia of Leadership brings together for the first time everything that is known and truly matters about leadership as part of the human experience. Developed by the award-winning editorial team at Berkshire Publishing Group, the Encyclopedia includes hundreds of articles, written by 280 leading scholars and experts from 17 countries, exploring leadership theories and leadership practice. Entries and sidebars show leadership in action—in corporations and state houses, schools, churches, small businesses, and nonprofit organizations. - What is a leader? - What is a great leader? - How does someone become a leader? - What are the types of leadership? - How can leadership theories help us understand contemporary situations? - How can I be a good (and maybe great) leader? 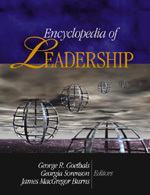 The Encyclopedia of Leadership is an unprecedented learning resource. Scholars, students, professionals, and active citizens will turn to the Encyclopedia for guidance on the theory and practice of leadership, for the stories of great leaders, and for the tools and knowledge they need to lead in the 21st century. The Encyclopedia of Leadership will be a vital tool for librarians with collections in business, management, history, politics, communication, psychology, and a host of other disciplines. Students and teachers in courses ranging from history to psychology, anthropology, and law will also find this an invaluable reference.